This 3″ fabric dome midrange was previously manufactured by Vifa. It was known then as the D75MX. After the demise of Vifa, this driver was in real danger of vanishing into history. Fortunately, Scanspeak had the foresight to rescue it. The model number has been changed to D7608/920010 but it is essentially the same midrange. Unlike other mid-domes which have closed backs, a rear chamber must be built for the D7608. It should be treated the same as open back cone midrange drivers. The chamber should also be stuffed with glass wool to reduce internal resonances. For this speaker, I opted for the 8″ Usher 8137A woofer. It’s cone is of Kevlar and Carbon Fiber, resulting in it being lightweight yet rigid. Another reason for using the 8137A is I wanted a smaller box. This 3-way is only 25 liters (internal volume) and is a bass reflex. The Peerless 830869, on the other hand, needed 35 liters for the same F3. 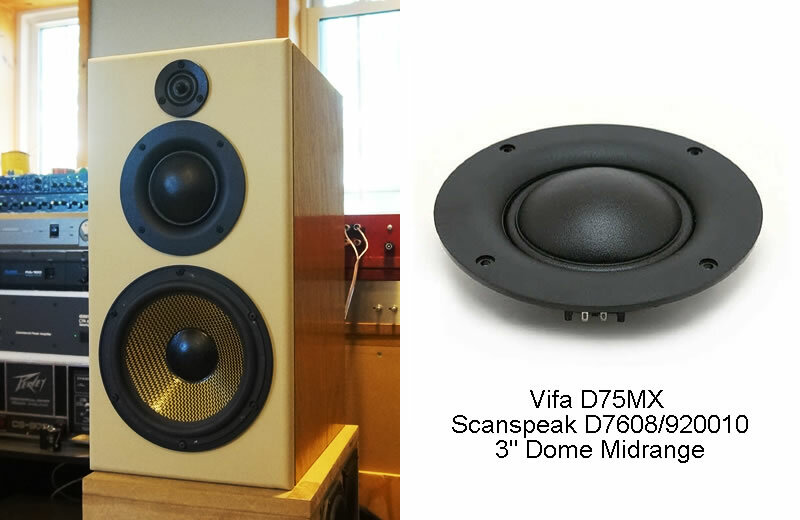 I retained the tweeter, the Peerless XT25SC90, so that it’s easier to compare the D7608 with the Dayton RS52AN 2″ dome midrange. The Blue trace in Fig 1 is the RAW response of Scanspeak’s D7608. The Red trace is with 800Hz High Pass (24dB/oct) and 4kHz Low Pass (18dB/oct). No equalization is applied electronically or passively. In Fig 2, the D7608 is crossed with the Peerless XT25SC90 tweeter at 4kHz, both at 18dB/oct with my Synergy amp. The Blue trace is the summed response. This plot (Fig 3), shows how the three drivers are crossed. The Usher 8137A and the D7608 are crossed at 800Hz at 24dB/oct whereas the XT25SC90 is crossed at 4Khz (18dB/oct) to the D7608. (Fig 4) Summed Response (No Smoothing, mic at 1 meter tweeter axis, 5 msec gating). Disregard measurement below 500Hz. Fig 4 is the summed response of this 3-way. Disregard measurement below 500Hz. My room is interfering with the response. Generally, the response is within a 5dB window. However, it is not as flat as the version with the RS52AN. There is a gentle valley at 1kHz, followed by a dimple at 2Khz. The Scanspeak D7608 is absolutely bewitching. It has that distinctive “zing” that was the hallmark of the Vifa premium line silk dome tweeters. Instruments like acoustic guitars, cymbals, even pianos have that sparkle in their music.